Question: I’m having trouble with Dust Bunnies, it crashes/is slow/doesn’t work! 1. Restart your iPhone, iPod or iPad (hold down the lock and home buttons, slide to turn off, then turn back on). This should fix most performance problems. 2. If that doesn’t work, try deleting Dust Bunnies from your device and re-installing from the App store. If that still doesn’t work, please let us know on our contact page! Question: My name isn’t included! Head on over to the names page to let us know! Question: Can I play Dust Bunnies on a big screen with a projector or on a TV? Dust Bunnies doesn’t do anything special to support this, but video mirroring is available on the iPad 2, new iPad and iPhone 4s. On these devices you just need to plug in your VGA or HDMI cable and the app should show on the screen. For more information, check out Apple’s Knowledge Base article about Video Mirroring. Question: What’s the music that plays on the menu screen? That’s The Snow Queen by Ken MacLeod. 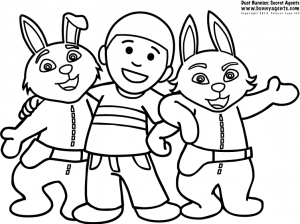 Check out our cool coloring pages! Dust Bunnies: Secret Agents is now available!